At one time, Ford owned Britain’s Aston Martin. That makes today’s Nice Price or Crack Pipe Mustang look perhaps a little too incestuous, but will its price have you wanting to add it to your family? Joseph Carey Merrick was certainly an unique individual. Better known as the “Elephant Man” for his severe, and to this day not fully diagnosed, physical malformations, he nonetheless did not substantially profit from his distinctive appearance. Yesterday’s 1988 Cadillac Cimarron convertible was also unique and seemingly one of a kind. It was however, vastly more aesthetically pleasing than poor Mr. Merrick. That didn’t quite quell the negative responses to the car, as the J-car’s tainted reputation apparently precedes it wherever it goes, and in whatever form it takes. Vitriol does not equal value and hence, even at $5,500 that clean and interesting car fell in a 79% Crack Pipe loss. Today we’re going to stick with that $5,500 price as well as with the theme of cars that aren’t what they at first seem to be. Here we have a 1999 Ford Mustang (SN-95) in GT mode with a highly desirable five-speed. What’s that you say? You’re wondering if it’s parked in the background, perhaps hidden by that black Aston Martin Vanquish? Why doesn’t the seller move the Aston so we can see the ‘Stang? Well friends, have I got news for you. That Aston IS the Mustang. Yep, I know it’s a pretty convincing disguise, almost Witness Protection Program good, but it is in fact a Mustang under that Savile Row suit of Astonian Bodywork. As you might expect, this identify crisis of a car is offered for sale in Florida, a state known for many odd things—such as its killer fauna, its embarrassing wang shape, and the crazy people who inhabit it. Actually, people in Florida aren’t any crazier or dumber than people in, oh say Alabama or Georgia to pick two geographically similar locales. It’s just that it seems the police in the state release every nutty crime and call report they get to the news media who then reports it like a tattle tale five-year-old. Of course, this car’s still pretty crazy. Tht being said, fiddy-fibe for a car that could pass for a Vanquish on a dark night is something well worth considering. Plus, it’s an SN-95 underneath and those are like the IUDs of cars—dependable and pretty safe while still ensuring you’ll have fun without getting into too much trouble. The ad doesn’t go into much detail about the car but what is offered is done so in all caps so you know it must be important. It’s a GT so it must have a 260-bhp SOHC 4.6 V8 under its Aston-y hood. There’s also the claim of there being a five-speed stick backing up that V8. Underneath it’s all massaged Fox body and on top of that it’s Aston Martin. The result is a car that looks like it belongs in a James Bond movie where 007 is played by Adam Sandler. What we can glean from the pics is that the driver’s side headlight cover seems to be missing and that the Aston Martin-ness appears to stop at the waist, the roofline still betraying its plebeian Mustang origins. Wheels are donk-alicious and wrapped in rubber bands rather than tires and the fuel door looks like it’s off of a Hot Wheels car. Overall it’s just weird enough to be interesting. The question for you is: could this Astang Martin be interesting enough to command its $5,500 asking price? Does that seem like market value for this mystery machine? Or, is this an AM that has you LOL’ing for that price? H/T to L322Rover for the hookup! 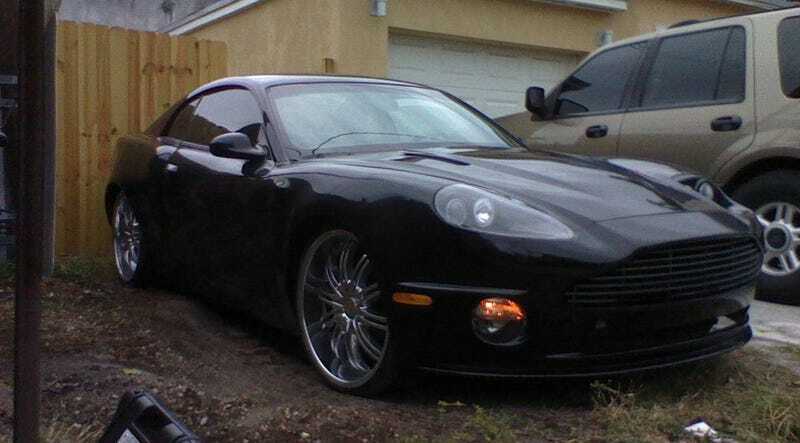 For $27,995 Could This 2002 Aston Martin DB7 Vantage Be The Best Worst Idea Ever?